Save the date for this special double bill! Marina V is a talented singer-songwriter with an unusual back story. She grew up in Moscow and was trained as a classical pianist. Then she was exposed to English-language pop music through cassette tapes smuggled into Russia. She spent a year in the U.S. as an exchange student in high school and decided she really wanted to leave Russia for the west, to become a songwriter. She emigrated here, met and eventually married Nick Baker, her musical partner, and has been a musician here ever since. The Los Angeles Times called Marina’s music “hauntingly beautiful” and the Prague Post said she has “the voice of an angel.” Keyboard Magazine called her “one of the most promising new singer/songwriters” Describing her own musical influences, Marina says, “If the Beatles and Tori Amos had a child raised in Russia by Tchaikovsky, that would be me.” Marina plays mostly keyboards, along with a bit of guitar, and she will be joined by her husband, Nick Baker, on guitar. 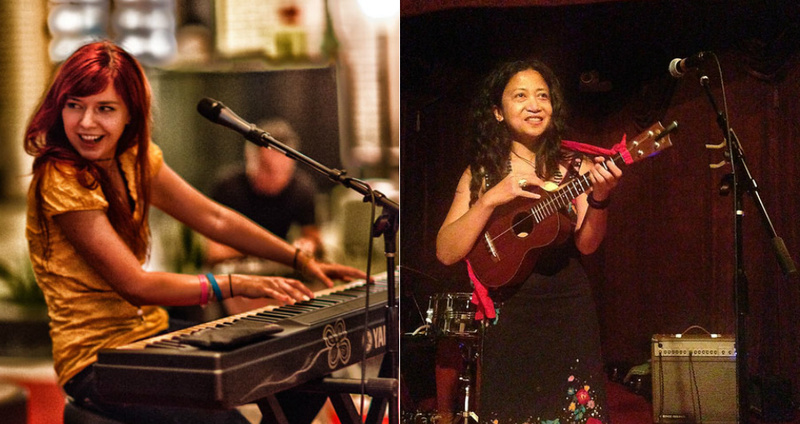 Aireene Espiritu was born in the Philippines, but grew up here, influenced by the music of both lands, especially the Filipino finger-style guitar playing of her family, and the Alan Lomax song collections of the American south. Thus her music, featuring guitar and ukulele, has tinges of gospel, blues and traditional folk music, but almost all of the songs she performs are original, including her reply to one of the Lomax songs. When asked to describe her music, she called it “Stompin’ Swayin’ Americana.” That’s a fair description, as you can hear a melting pot of musical influences from East, West and South. Most musicians would be hard-pressed to use the tenor uke as a blues instrument, but for Aireene, it works. She will be joined by Edward Tree on guitar, a man who is also known for his songwriting.